Howling winds, drifting snow, and cold temperatures make it challenging at times to leave the comfort and warmth of our homes. Snuggling up by a warm fire, with a book or tablet and a cup of coffee is relaxing. If you choose to use a fireplace or other supplemental methods to heat your home, please make sure you take the necessary precautions. Did you know that half of all home heating fires occur in December, January, and February? Each year home fires cause 890 deaths and $2 billion in property loss. The most common time for fires to occur is 5:00-8:00pm. Here are some heating safety tips to prevent your home from catching fire this winter. 1. Follow the three feet rule. Keep flammable materials at least three feet away from fireplaces, wood stoves, and space heaters. 2. Test your smoke and carbon monoxide detectors regularly. Consider replacing batteries when Daylight Savings Time begins and ends. 3. Avoid overloading electrical outlets. 4. Don’t use candles during a power outage. Rely on flashlights instead. 1. Reading is fundamental. Always read your owner’s manual and look at warning labels. 2. Directly plug into a wall outlet. Never plug a space heater into an extension cord or power strip. These alternative electrical sources could overheat and cause a fire. In addition, don’t plug anything else into the wall outlet that is being used by the heater. 3. Inspect the cord and plug regularly. After removing it from storage, it’s a good idea to be on the lookout for broken plugs or frayed cords. 4. Keep out of walkways or common areas. 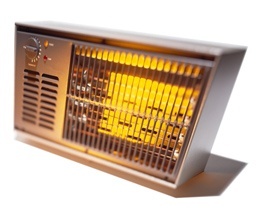 Never place a space heater in a doorway or common area like the kitchen. 5. Keep an eye on young children or pets. Both are very inquisitive. Turning your back for a split second could lead to an injury. 6. Keep them on flat hard surfaces. It’s a good idea to keep them off furniture such as cabinets and tables. In addition, if you have long thick carpet, consider laying down a piece of wood or a flame resistant mat. 7. Turn out the lights. When you decide to call it a night, make sure you turn it off. 1. Insect your chimney yearly. Experts recommend you have your chimney inspected each year. How much you use your fireplace will determine if you need a chimney sweep. 2. Wood Type. You can burn any type of hard or soft wood as long as it’s seasoned. Seasoned wood is wood that’s cut, especially oak (hardwood), and sits idle in a dry environment for a full year. Properly seasoned wood creates hot fires, which produce less creosote resulting in less buildup on your flue and in your chimney. 3. Use a mesh screen. Have a large screen in place to prevent sparks from landing on the floor. 4. Doors open or closed? The stage of your fire determines whether the glass doors should remain open or closed. When starting a fire, leave the doors open to allow for proper airflow. If you’re enjoying a fire with family or friends, having the doors open allows you to enjoy the ambiance of the fire. When you leave the room, close the glass doors to keep the fire contained. Always keep a watchful eye. 5. Keep the area clear. When enjoying a fire, make sure it’s clear of items that could catch fire from a spark. 6. Safely stack the logs. Remember, this is an indoor fire. Stack logs near the back and only a couple at a time. Roaring fires aren’t meant for indoors. 7. Store cooled ashes in a metal container. Experts recommend storing cooled ashes at least ten feet from your home and other buildings on your property. 1. Purchase the recommended pellets. Refer to your owner’s manual and purchase the right pellets to ensure your stove runs and operates efficiently.